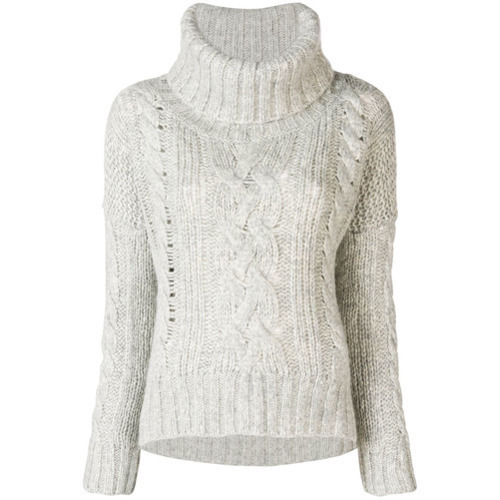 If you're on the hunt for a casual yet chic getup, consider pairing a grey knit turtleneck with white skinny jeans. Both pieces are totally comfy and will look fabulous paired together. When it comes to shoes, this outfit pairs perfectly with grey suede over the knee boots. 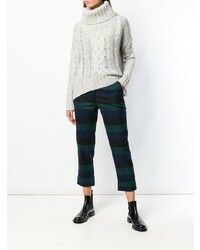 If you're scouting for a casual yet chic ensemble, marry a Woolrich cable knit jumper from farfetch.com with white skinny pants. Both garments are totally comfy and will look fabulous together. When it comes to shoes, this outfit pairs nicely with black leather loafers. 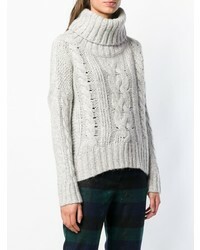 If you're hunting for a casual yet totally chic outfit, opt for a grey knit turtleneck and black ripped skinny jeans. Both pieces are totally comfy and will look fabulous together. Got bored with this ensemble? Enter brown suede ankle boots to shake things up. 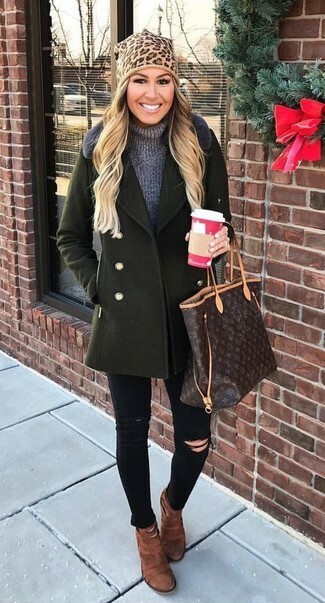 If you're looking for a casual yet absolutely chic look, marry a Woolrich cable knit jumper with black ripped skinny jeans. Both garments are totally comfy and will look fabulous together. Rocking a pair of dark brown nubuck ankle boots is a simple way to add some flair to your outfit. 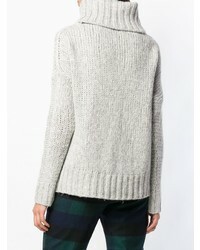 If you're after a casual yet chic outfit, rock a Woolrich cable knit jumper with black leather skinny jeans. Both garments are totally comfy and will look fabulous paired together. Make your outfit more fun by complementing it with tan suede lace-up flat boots. If you're on the hunt for a casual yet stylish ensemble, consider wearing a Woolrich cable knit jumper and light blue ripped jeans. Both garments are totally comfy and will look fabulous paired together. If you're searching for a casual yet stylish look, team a Woolrich cable knit jumper with charcoal skinny jeans. Both items are totally comfy and will look fabulous together. Black slip-on sneakers will deliver a sportier vibe to your outfit. 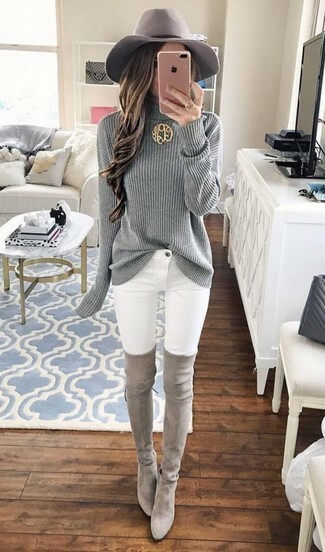 If you're on the lookout for a casual yet absolutely chic getup, choose a grey knit turtleneck and black tapered pants. Both garments are totally comfy and will look fabulous paired together. Go for a pair of black slip-on sneakers to make the ensemble more current. If you're in search of a casual yet stylish look, choose a Woolrich cable knit jumper from farfetch.com and blue ripped skinny jeans. Both items are totally comfy and will look fabulous paired together. Wearing a pair of charcoal suede pumps is an easy way to add some flair to your outfit.